James McIntosh was 14 when he discovered hard cider. It was legal, he hastens to add, since he was visiting France at the time. That first taste got him wondering. Why wasn’t someone doing this in Meaford? 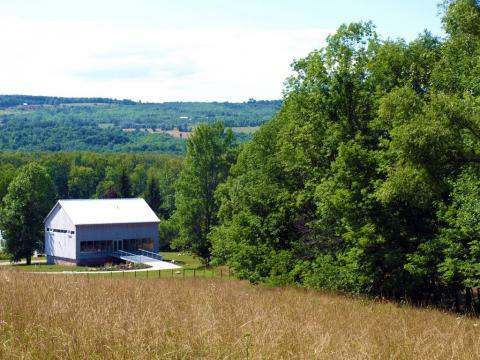 Raised in Toronto, James spent his childhood and teenage summers at his grandmother’s Meaford farm, up the Duxbury Sideroad overlooking Georgian Bay, and he was well aware of the local apple industry. The idea took hold. Twenty years later, he’s releasing his second batch of Duxbury Cider, which is available at a number of restaurants in Ontario, including Ted’s Range Road Diner and The Leeky Canoe in Meaford; Shorty’s Grill in Owen Sound and The Barrhead Pub and Grill in Markdale. After moving to Meaford full-time in 2005, he read a book on cider making and started “tinkering”, using home wine equipment and a borrowed apple press. The results, he says, were “drinkable”. But over time, his experiments bore, ahem, fruit. By fermenting different varieties of apples separately, he gained an understanding of their characteristics and flavours, and his blends became more complex. James has planted his own orchard, and makes his cider with only local apples. “It’s all about ways to support local growers,” he says. A couple of years ago, he began working at Coffin Ridge, which produces its own cider along with its wines, and he arranged to use their larger-scale equipment as part of his employment. 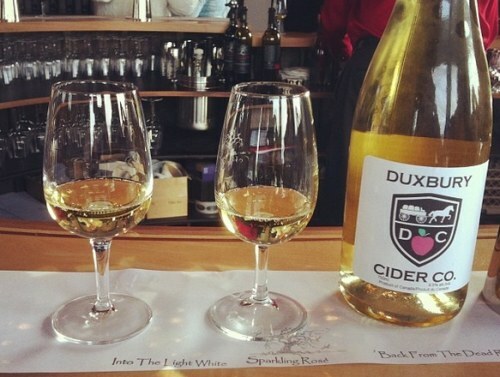 Last summer, he released the first batch of Duxbury Cider to rave reviews. Local restaurants, as well as locations in Toronto and Stratford, were quick to appreciate the unique new cider. “I just started really small and let the cider talk for itself,” says James. In addition to enjoying draft Duxbury Cider where available on tap, you can also purchase bottles at Coffin Ridge and from the website (as available). Meaford has long been known for its apples, and if you’ve purchased non-alcoholic cider before, you may have enjoyed the taste of them in a refreshing form. But hard cider has a long tradition in Ontario, and many pioneer farms used the windfall from their orchards to ferment their own batches. Today, hard cider’s experiencing a resurgence. It has become the fastest growing alcoholic beverage in the province, and in recent years, new cideries producing hard cider have cropped up throughout the nearby area. 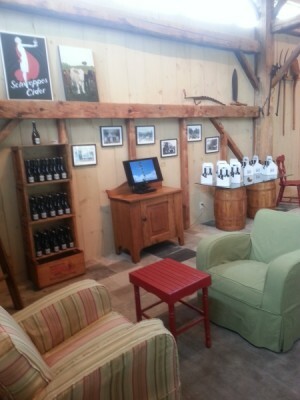 In the next few weeks, we’ll visit our local craft cideries so you can plan a cider tour of Meaford and area. Ten minutes from Meaford Haven, you’ll find Thornbury Village Cidery, in the large, old poured-concrete building that housed handling facilities for Mitchell’s Apple Juice a generation ago. There, Cider Master Doug Johnson and his team produce Thornbury Premium Cider, a dry, crisp beverage made from 100 percent fresh-pressed local apples. The company launched in 2008 as Ontario’s second cidery, and one of the pioneers in the Ontario cider boom. Started by Andre Corbeil and group of (mainly British) investors, the company’s flagship cider was such an immediate hit, that the company was recently bought by Beer Barons (now King Brewery). Thornbury Premium Cider is a “light, easy to drink, champagne-style cider with just a very slight hint of apple,” says the company’s website. 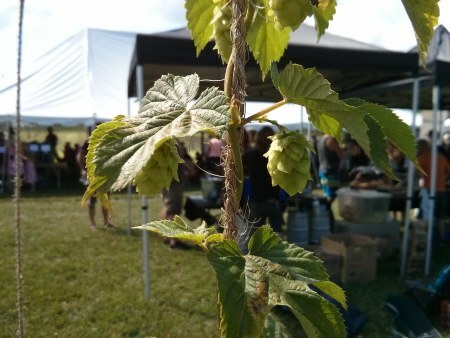 Unfortunately, you can’t tour the cidery or taste samples there, but you can easily find yourself a pint at many of the restaurants within walking distance of the cidery (or at the LCBO). Stay tuned for our next stop. Local apple cider comes in a variety of delicious forms. There’s the thick, smooth cider that does double duty. It tastes great cool on a sunny autumn day, and it can warm away the winter when it’s mulled with cinnamon, allspice and cloves and served hot – preferably by a crackling fire. Our area has its own homegrown hard cider, made just down the road in Thornbury. 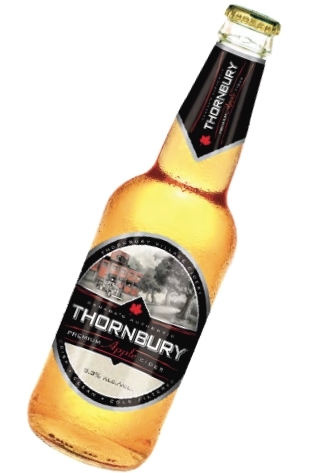 Thornbury Premium Cider has quickly become both a local favourite and a popular choice throughout the province. 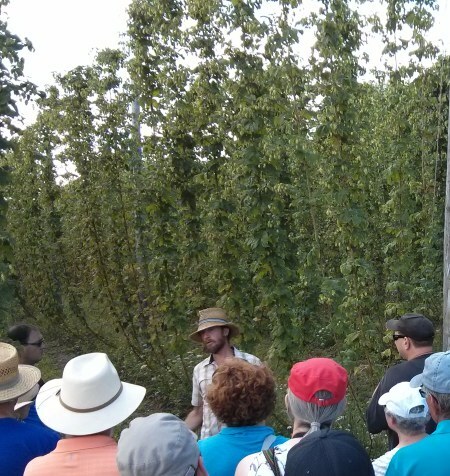 A few years back, in 2007, Andre Corbeil was looking to come out of his early retirement, and he happened upon a group of mainly British investors interested in the market for cider in Ontario. Before long Thornbury Village Cidery had been established as only the second cidery in Ontario. (It has since been followed by other cider startups.) 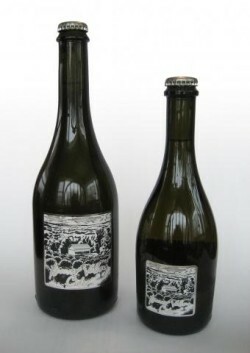 Corbeil decided to craft something different from the traditional British ciders, and he turned to Doug Johnson to create it. 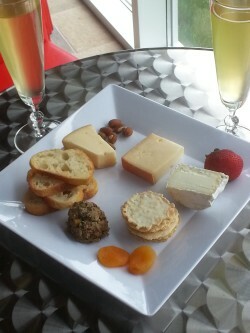 The result was Peeler Premium Light Cider, a refreshingly light, champagne-style apple cider that made for perfect refreshment on a summer’s day. It quickly appeared at local restaurants, bars and ski resorts, followed by other restaurants and LCBO outlets throughout Ontario, putting Thornbury Village Cidery on the map. The success caught the attention of Beer Barons, a Toronto-based craft beer importer looking to get into brewing, and this past summer the company bought the cidery. Mmmmm, think it’s time to take a refreshment break.